Cheesy Spaghetti Pie is comfort food at its finest. It’s basically a baked version of macaroni and cheese only the pasta used in the recipe is spaghetti. Whether it’s macaroni or cooked spaghetti pasta, any dish that’s made with pasta and cheese is alright by me! 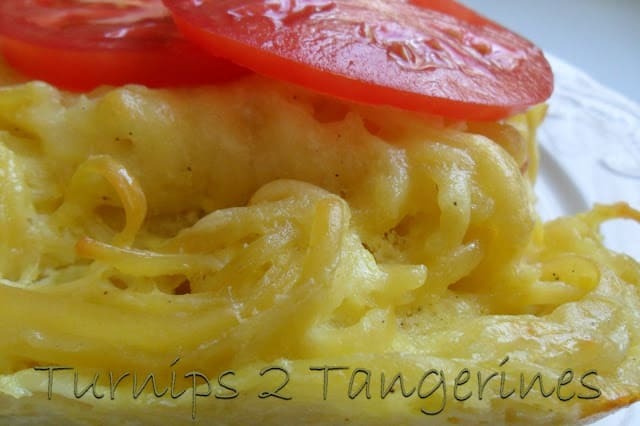 This simple recipe is made with shredded Swiss cheese, eggs, evaporated milk, and spices. The same ingredients found in macaroni and cheese but with one exception. Since cooked spaghetti pasta or noodles are used there is a higher ratio of crunchy edges than when using macaroni. Why is this so important you might be wondering…because the outer, crunchy edges are my favorite! You can have the middle, just save the outside for me!! Since cheesy spaghetti pie is a very rustic style dish, we like to keep it simple and serve spaghetti pie with sliced tomatoes. Preferably with fresh, garden tomatoes. If that isn’t possible a simple cucumber salad would be great also. Cool Cucumber Radish Salad would be the perfect accompaniment to cheesy spaghetti pie. Have an excessive amount of garden fresh tomatoes? 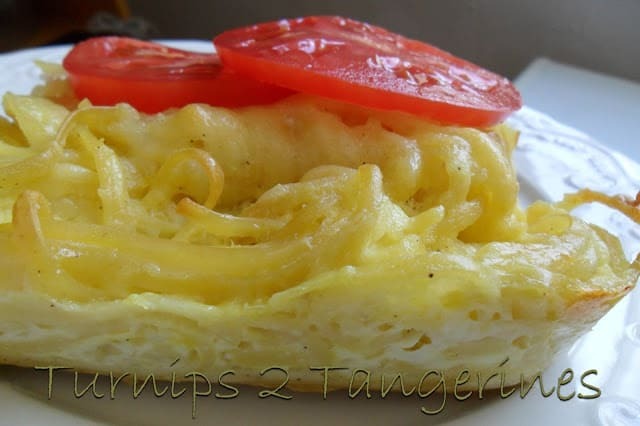 Serve sliced with spaghetti pie. Delicious new and different mac n' cheese. Preheat oven to 350º Place half of the cooked spaghetti in a lightly buttered 13 x 9 inch baking dish. Sprinkle with half the of cheese. Repeat layers. Combine flour, salt, pepper, and dry mustard in a small bowl, whisk in 1 tablespoon milk. Add remaining milk and eggs to flour mixture, stirring with a wire whisk until blended. Pour milk mixture over spaghetti mixture. Dot with butter. Bake at 350º for 45 minutes or until set. Let stand 5 minutes before serving. Serve with garden fresh, sliced tomatoes. 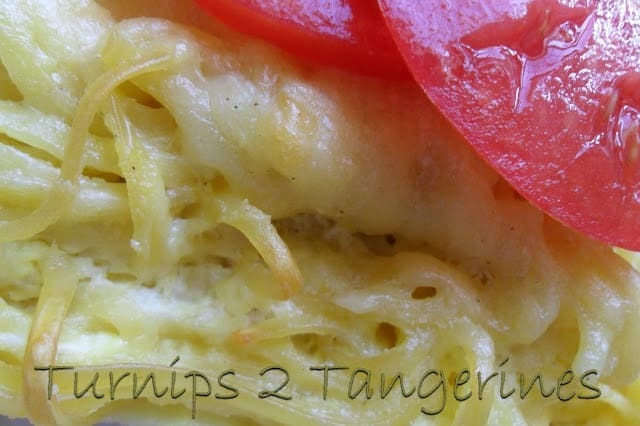 Stuffed Cabbage Rolls is another classic recipe that we love here on Turnips 2 Tangerines. Love all the ooey, gooey, cheesy goodness in this dish. Great comfort food. Thanks for sharing on Thursdays Treasures. Your Spaghetti Pie looks awesome, we will really enjoy this dish. Have a great St. Patrick’s Day and thank you so much for sharing with Full Plate Thursday. I haven't had a spaghetti pie in years. Yours looks so delicious. Thanks for sharing on Foodie Friends Friday. You co host from Nosh My Way. This looks good! Definitely a comfort food. Great photos! This looks yummy!